Caption - Another memory from the island of Negros in the Phillipines dating from January 1978. The loco is Victorias Milling Company no.17BG a very nice Bagnall 0-4-4T dating from 1926. Within a few minutes the loco stocked up with bagasse and headed for the cane fields to collect loaded cane cars. 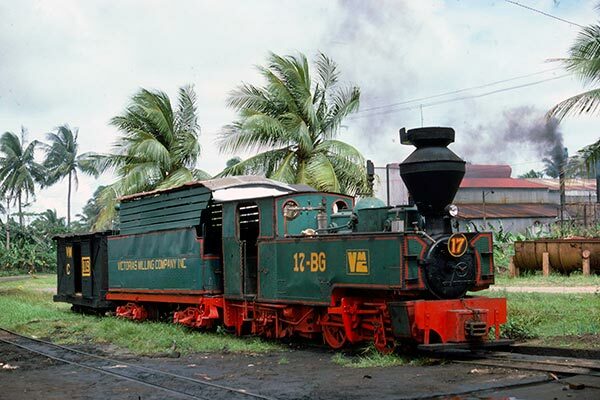 No.17 was purchased second hand from a railway near Hong Kong. The large tender, added after the loco was purchased by the mill, is to accommodate bagasse a fuel with a very low calorific value.